Confession: The majority of Gizmodo staff lives in Williamsburg, so we count ourselves in this mass of angry "hipsters." 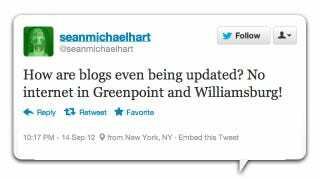 But here's the deal: The Internet went down in Williamsbug/Greenpoint (Brooklyn) today at approximately 3:54PM (EST). And, seven hours later, at 10:56PM (EST), word on the street (by which I mean Twitter) is that it is still down. As of 11:31PM (EST) we have confirmation that it is BACK IN ACTION. "Hear that?" would have made more sense, but okay. ...which is why, besides sheer necessity, I am blogging from Manhattan. I'd rather stay in Manhattan. Lots of talk of rioting on Twitter. Lots.